Funeral directors from throughout Connecticut have come forward to help the grieving town, another example of support that's so desperately needed. NBC's Anne Thompson reports. Updated at 4:50 p.m. ET: With tears and hugs, a grief-rocked Connecticut town said farewell Monday to the first of its slain children: two 6-year-olds being buried in unbearably small coffins on a cold, gray day. The funerals of first graders Noah Pozner and Jack Pinto will be followed by two dozen more services over coming days as the other children and staffers murdered at Newtown's Sandy Hook Elementary School on Friday are laid to rest. A misty rain was in the air as mourners -- many in black, others in school gear emblazoned with a capital “N” -- gathered outside the Honan Funeral Home on Main St. for Jack’s funeral. Mourners said the sports-loving youngster was wearing the red-and-white jersey of his idol, New York Giants wide receiver Victor Cruz, who had honored him by printing his name on his cleats for Sunday’s game. At a viewing before the packed service, where psalms were read, more than two dozen members of his wrestling club presented Jack’s grandmother with their medals. “We’re broken,” Jack Wellman, 13, who helped coach the junior wrestlers, said outside the funeral home. 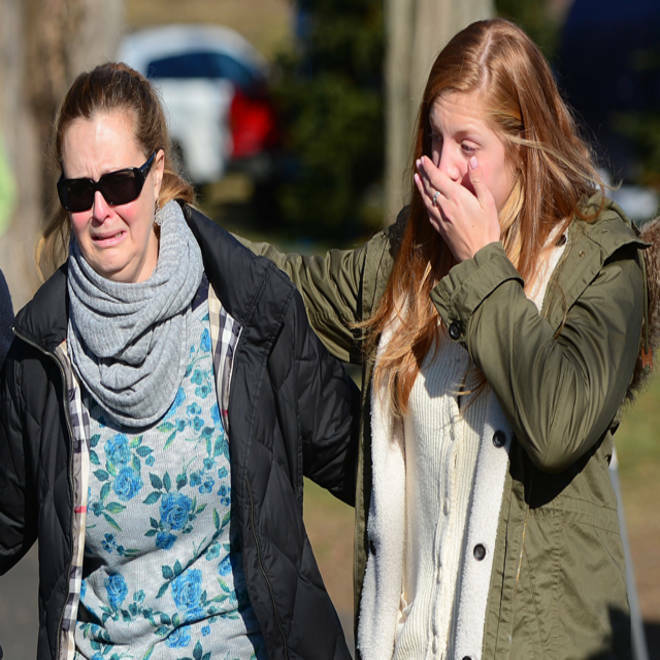 The second deadliest school shooting in U.S. history sent crying children spilling into the school parking lot as frightened parents waited for word on their loved ones. Twenty-five miles away, in Fairfield, Noah’s family gathered at another funeral home, on a street where some nurses had decorated lampposts with white balloons and well-wishers left teddy bears and flowers at the base of a maple tree. Connecticut Gov. Dannel Malloy met with family before the service at the Abraham L. Greene & Sons Funeral Home, where the brown-haired boy was laid in a simple wooden casket adorned with the Star of David. Noah's mother, Veronika Pozner, spoke and called her son "her little man," according to Rabbi Yehoshua Hect. An uncle, Alexis Haller, remembered Noah – whose twin sister, Arielle, was in a different classroom and survived Adam Lanza's murderous rampage -- as a funny child with a mischievous streak. "If Noah had not been taken from us, he would have become a great man. He would been a wonderful husband and a loving father," Haller said, according to remarks he provided to The Associated Press. It is unspeakably tragic that none of us can bring Noah back," he said. "We would go to the ends of the earth to do so, but none of us can. What we can do is carry Noah within us, always. “We can remember the joy he brought to us. We can hold his memory close to our hearts. We can treasure him forever." There will be no reprieve from the sorrow in Newtown this week, as each day brings more funerals. On Tuesday, there will be a noon service at St. Rose of Lima Church in Newtown for Jessica Rekos, 6, a girl who loved horses and had asked Santa for cowgirl boots and a hat. Her parents had promised to get her a horse when she was 10. “She was a creative, beautiful little girl who loved playing with her little brothers, Travis and Shane,” her family said in a statement. “She had an answer for everything, she didn't miss a trick, and she outsmarted us every time. We called her our little CEO for the way she carefully thought out and planned everything,” they wrote. As a community mourns those who were killed in the Sandy Hook Elementary shooting on Friday, children and parents come to terms with the tragedy. NBC's Michelle Franzen reports. The funeral of teacher Victoria Soto, 27, is scheduled for Wednesday at 10 a.m. at Lordship Community Church, Stratford. Burial will follow at Union Cemetery in Stratford. Soto’s cousin, Jim Wiltsie, told the Wall Street Journal that she had tried to shield her first-graders from the bullets. "That is how she was found. Huddled with her children," Wiltsie said. Seven-year-old student Daniel Barden’s funeral will be held at 10 a.m. Wednesday at St. Rose of Lima Church, followed by burial at St. Rose Cemetery. A funeral mass for student Catherine Hubbard, 6, is due to be held at 10 a.m. Thursday at St. Rose of Lima Church, followed by burial at St. Rose Cemetery. Her parents, Jennifer and Matthew Hubbard, released a statement expressing gratitude to emergency responders and for the support of the community. “We are greatly saddened by the loss of our beautiful daughter, Catherine Violet, and our thoughts and prayers are with the other families who have been affected by this tragedy,” they said. The Connecticut Funeral Directors Association is releasing details of the services, and victims’ families have been releasing statements with poignant memories. The family of Ana Grace Marquez-Greene, 6, called her “our precious angel” – a generous spirit who left “I love you” notes under her parents’ pillow, who learned to sing before she talked, and who danced from room to room in her home. “We ask that you pray for the legions of people who are left behind to cherish memories of her,” wrote her parents, Nelba Marquez-Greene and saxophonist Jimmy Greene. Watch the entire interfaith vigil for Connecticut shooting victims, including President Obama's speech.